It has been a long time since I actually updated my blog. Mainly because I haven't been able to play outside as much this year as I would like. However, with that said, I was able to build and buy some really cool gear this year. My biggest purchase of the year was my new hammock, a Warbonnet Black Bird. I had been oogling the Black Bird hammock for quite some time before actually buying one. 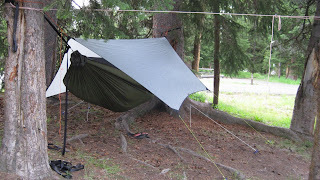 After researching mutiple hammock brands and building one of my own I decided that the best hammock for me was the WBB. It has an integrated bugnet, a footbox that aids in you laying flat, and a built in shelf/pocket for storing gear. It wasn't cheap but I can say that it is the best night of sleep I have got in the woods. It is nice and roomy on the inside and may be more comfortable than my bed at home. I have been able to use it a few times this year and was even able to get my wife to sleep in it during a trip into Yellowstone. She loved it!! She had been thinking my hammock obession was really weird, yet it only took one night in it and she decided it was the only way to camp. I got the 1.7 DL (double layer) version with the strap suspension system. If I get another one I will get a single layer 1.7 or maybe the 1.1 DL, since my weight doesn't come close to being an issue for either of those options. It is a large hammock and does need a pretty decent tarp to adequately cover it, however my OES Spinntex Deluxe tarp works really well. So far I am really happy with it and have officially retired my other hammocks to the loaner pile.